Amiyah King entered this week with 710 assists and 151 digs for the season. Journal photo by Mark Almond. Amiyah King has finally arrived. 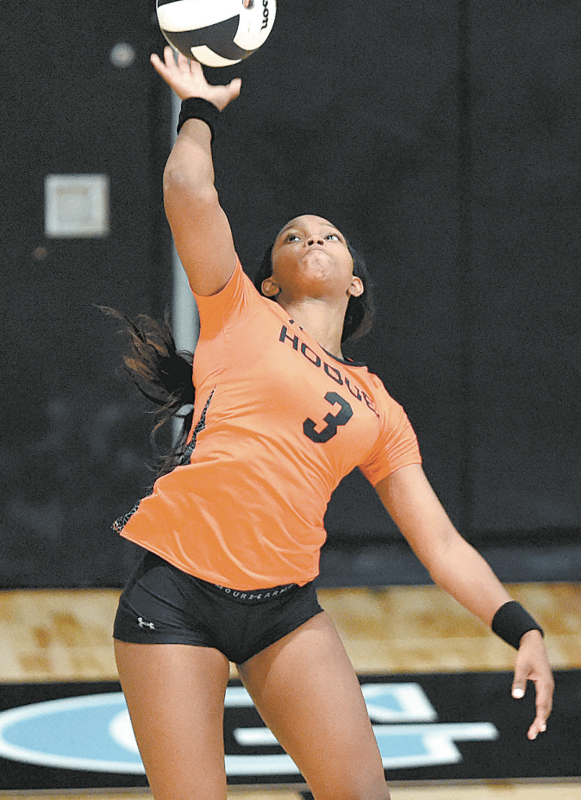 The senior setter is wasting no time making her presence felt on the Hoover varsity volleyball team. She has become the Bucs’ unquestioned leader. “Instead of being in the role of cheering on my teammates, I’m in the middle of the rotation, leading, being the main passer and trying to keep everybody on the same emotional level,” she added. Before this season, King could have been a case study in athletic perseverance. When she was in the seventh grade, she tried out for the Bumpus Middle School team and was cut. Instead of walking away from volleyball and trying another sport, King tried out for a club team and made it. After joining the club team, she began honing her skills. “I kept practicing and got into a rhythm,” she said. With her vastly improved skills, King tried out for the Bumpus team again in the eighth grade, and this time she made the cut. “It’s been a lifestyle since then,” she said. King spent her freshman and sophomore seasons at Hoover on the junior varsity. She finally moved up to varsity her junior year, in 2017, but she was a reserve player because of the presence of three-year starting setter Jamie Gregg. Even so, King found plenty of time on the court. When she wasn’t playing, King was the consummate team player, cheering on her teammates while learning from Gregg. Gregg is now a freshman softball player at Mississippi State. The insights King gained while watching from the bench have proven invaluable this season. “She is an exceptional athlete,” Camper said. “She’s been in a lot of big matches, so I think that’s why she’s been very comfortable in her role from the first day. Last week in a 3-1 victory at Oak Mountain that gave Hoover a 3-0 record in Class 7A, Area 5, King led the Bucs with 51 assists, five digs and two aces. During the weekend, she recorded 144 assists and 33 digs in five games as the host Bucs (24-7) went 3-2 in the Hoover Over the Mountain Tournament before losing in the quarterfinals to Mountain Brook. King entered this week with 710 assists and 151 digs for the season. King enjoys setting, although she has played other positions. King hopes to play volleyball in college. “I’m talking to a few schools, but I hadn’t decided anything,” she said. Meanwhile, she’s trying to lead the Bucs back to the state tournament. Last year, Hoover was eliminated in the Class 7A quarterfinals by eventual champion McGill-Toolen.